Take a weekend trip to Main Street and find perfect Christmas gifts in revitalized historic districts all across the state. Above: Downtown Ratón shines brightly with holiday finery. IF YOU&apos;VE WALKED AROUND the historic downtowns of any number of New Mexico cities and towns, you may have noticed it. Things are changing, from Artesia to Zuni. Perhaps it’s a new park bench with mosaic murals fringing a smartly landscaped pocket park, recently installed vintage-style streetlamps along a formerly dark street, or the restoration of a stucco storefront that had been covered with historically inappropriate cedar-shake siding. Maybe you’ve attended a downtown gallery hop or holiday-time electric light parade. At the very least, you’ve probably noticed the influx of independently owned boutiques, coffeehouses, art studios, and bistros in the state’s downtowns, many of them thriving inside handsome Victorian and Spanish Colonial buildings. 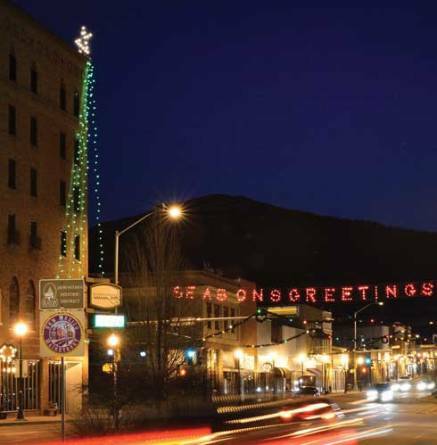 Much of that revitalization is thanks to New Mexico MainStreet, a statewide program that helps local communities make historic districts more vibrant, viable, and visible—and never more so than at Christmastime. So it’s a fine time of year for venturing to those places you’ve been meaning to explore and seeking out some one-of-a-kind, only-in-NM treasures to put under the tree. Visitors will be greeted by seasonal festivities, and take some comfort in knowing that for every $100 you spend locally, $68 stays in town, versus just $43 from non-local retailers. Get the ball rolling by shopping New Mexico MainStreet districts on Small Business Saturday, November 26, when many shops extend their hours, offer special deals, and welcome customers with cocoa, cookies, and other treats. These towns have got the right spirit. A longtime base camp for nearby outdoor adventures, Farmington has made bold strides toward reinvigorating its downtown. Galleries and shops have opened, and traffic improvements make it easier to be a pedestrian or cyclist. 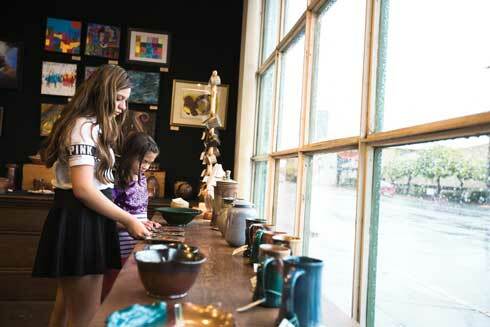 Creative-based businesses, like galleries and trading posts, have fueled the downtown renaissance. Be sure to spend time at Artifacts Art Gallery, a 116-year-old lumber and hardware center that now hosts the studios of 16 artists plus galleries representing more than 40 additional creators. The space also contains the 302 Main Espresso coffeehouse and The Chile Store, where stocking stuffers range from Hatchup Katchup to Señor Murphy chocolates. There’s a high-ceilinged space with armchairs and sofas, perfect for sipping coffee and checking off your holiday shopping list. You’ll find more creative gifts at Studio 116, which carries the boldly colored abstract paintings of owner Karen Ellsbury and the nature photographs of Patrick Hazen—plus smaller gift items, including painted mugs and sculpted-metal animal figurines—and at the new Hubble & Barr Galleries, opened in September by award-winning New Mexico landscape oil painter Rod Hubble and contemporary woodworking artist Steve Barr. Other good bets for one-of-a-kind finds include the Dusty Attic and A Beautiful Mess, both of which specialize in antiques but also carry art and quirky gifts. This is also one of the best neighborhoods in the state for trading posts, with Foutz Teec Nos Pos Pawn, Alex Benally’s Hogan, and Navajo Trading Company abounding with Navajo rugs, hand-thrown pottery, carved Kokopelli figurines, and exquisite baskets. Above: Shoppers stroll through Farmington&apos;s Artifacts Art Gallery, housed in the same 1900 building as 302 Main Espresso and the Chile Store. Holiday shoppers have several noted downtown restaurants to choose from, with longtime favorite Three Rivers Brewing continuing to earn kudos for its fine ales, including the Christmas tree–reminiscent Pineberry IPA and seasonal stouts and porters. Feast on soul-warming comfort fare in the restaurant and pizzeria. Heads up: The owners plan to add a microdistillery soon. Downtown Farmington adds a creative twist to the November 26 Small Business Saturday, a Holiday Art Walk that showcases local galleries. On December 4, the Miracle on Main Street craft fair takes place at the Farmington Civic Center. Festivities include carnival games, hot cocoa, and mulled cider. On a gentle bluff just a short walk from Main Street, Casa Blanca Inn contains nine rooms and suites furnished with sumptuous Southwestern antiques and artwork. Some units have deep whirlpool tubs and kiva fireplaces. Full breakfast is served in a sunroom with floor-to-ceiling windows overlooking a central courtyard. The Courtyard by Marriott also offers comfortable digs only a mile from historic downtown. In 1879, the railroad steamed into Ratón and left in its tracks a trove of Italianate, Queen Anne, and Romanesque Revival buildings and storefronts that continue to receive care and a steady influx of new tenants. The historic First Street District is seeing a number of improvements, and the onetime boomtown is even updating its rail depot and building a modern transportation hub next door—good news for those looking to explore Ratón’s Old West charm. Besides the handsome Mission Revival–style 1903 train station, the similarly striking 1910 Wells Fargo building contains Old Pass Gallery, where you’ll find hand-carved crosses, fanciful contemporary portraits, folk art, tree ornaments, and paintings of northeastern New Mexico’s sweeping prairies. On First Street, The Pack Rat stocks a wide assortment of fun curios and New Mexico–made goods, including holiday gift baskets and penny candy. In a vintage building with pressed-tin ceilings, Santa Fe Trail Traders is a go-to for reasonably priced Southwestern crafts, including sand paintings, intricate silver bracelets and necklaces, and dazzling weavings, while Solano’s Western Wear ranks among New Mexico’s top purveyors of leather jackets and vests, pewter-buttoned Old West shirts, wide-brimmed felt hats, and deerskin moccasins. Drop by Enchanted Grounds Espresso Bar for some panini, chicken poblano soup in a bread bowl, or a gingerbread latte. The town’s latest dining highlight, The Stakeout, opened recently in the opulent Romanesque Revival Palace Hotel and specializes in juicy steaks and creative craft cocktails. On November 26, Ratón’s Festival of Lights proceeds along historic First Street, followed that evening by a Navidad Ranchera holiday concert with acclaimed New Mexico mariachi singer Antonio Reyna at the handsomely restored Shuler Theater. The 1915 performance space has been fully renovated, complete with ceiling murals depicting local history and rococo decorative details. The town also organizes a Receipt Saver Program throughout the holiday season: For every $50 you spend at local businesses, you receive an entry in a prize drawing. Right in historic downtown, comfy and reasonably priced Hearts Desire B&B is a three-story pink Victorian house with four antique-appointed rooms, including a spacious third-floor suite with a full kitchen. Picturesque downtown Las Vegas—a frequent filming site for movies and television—features three connecting neighborhoods, each with its own distinct architecture and history: Old Town Plaza and Bridge Street, New Town and Douglas Street, and Railroad Avenue. The third showcases the stunningly restored 1899 Mission-style rail depot and adjacent Castaneda Hotel, a beloved Fred Harvey property that local hotelier and preservationist Allan Affeldt is restoring, while the city’s other downtown hubs abound with one-of-a-kind retailers and eateries, their success greatly aided by tree-planting campaigns and vacant-building refurbishments. The historic homes tour shows off Las Vegas’ wealth of Victorian-era heritage—and is worth a trip on its own. If you’re finding it a challenge picking out gifts for those who seem to have everything, a stroll amid the boutiques and galleries along Bridge Street and around the plaza should buoy your spirits. Duck inside Blowin in the Wind for dapper decorative housewares—think hand-carved folk furniture, smoothly polished sycamore and alderwood bowls, whimsical copper wind sculptures, and mosaic retablos. Over the past three decades, New Moon Fashions has built a loyal following for its breathable, naturally dyed tops, scarves, hats, and other casually elegant women’s wear. Tome on the Range is one of the state’s favorite indie bookstores, with new and hard-to-find used titles, including cookbooks, children’s stories, and works about New Mexico history and lore. In one of the prettiest structures in Las Vegas, Plaza Antiques packs curious treasures—vintage boots, early-20th-century cameras, Depression glass, and elk antlers. The Las Vegas Arts Council—organizer of the town’s October studio tour—operates Gallery 140 on Bridge Street, presenting a different local art exhibit each month. In December, see a “small works” group exhibit and Christmas sale. Break for a yogurt parfait or turkey-provolone-pesto sandwich at World Treasures Travelers Cafe, a convivial coffeehouse whose spacious high-ceilinged seating area is decked with fine weavings from Mora’s traditional Southwestern weaving collective Tapetes de Lana. El Rialto has been a favorite for authentic northern New Mexico cooking for nearly four decades, and adjacent Abraham’s Tiendita is a must for breakfast or lunch (Frito pie is a specialty). On December 2, the town’s famous Holiday Historic Homes Tour invites visitors to peek inside several fine homes and buildings decorated elaborately. The wildly colorful Las Vegas Electric Light Parade—at dusk on December 3—features a marching band, vintage fire trucks, autos, and floats strung with holiday lighting. The grand 1882 Plaza Hotel is a warmly furnished roost on a snowy December night—it’s also steps from the many lively businesses along Bridge Street. The gateway to Carlsbad Caverns National Park boasts an attractive historic core that’s decked in dazzling light displays in December. The downtown district has also witnessed an increase in independent businesses, many set near the grassy plaza, anchored by the stately Eddy County Courthouse, which was built in traditional Victorian style in 1892 and then redesigned in its current Spanish Colonial–Pueblo Revival look in 1939. The gift shop in the Trinity Hotel, set in an 1892 former bank building, stocks gourmet gifts, including jams, vinegars, and bottles of local Luna Rossa and Spirit of Seven Rivers wines, which you can also sample in the bar and restaurant. An eclectic new shop carrying women’s fashion and jewelry, Sassy Mo’s, also has gifts for the holidays, including colorful candy bouquets. Purchase Christmas decorations and the perfect holiday card at Candlewood Cards and Gifts. And find watches, diamond heart pendants, and silver-amethyst earrings at Cone Jewelers, whose handsome new façade is the result of a MainStreet grant. For a bite to eat, head to the Lucky Bull Grill, inside the adobe Old City Hall building for decadent pub fare, including green chile grits and house-made potato chips with queso. A newcomer that’s quickly garnering attention, Milton’s Brewing serves a red chile–chocolate stout that’ll take the bite off a crisp winter day—this genial taproom is by the historic Carlsbad rail depot. With its entertaining Christmas on the Pecos held throughout December, Carlsbad has become one of the state’s top holiday destinations. The season begins on November 26, with the National Shop Small @ Carlsbad festival, which culminates with the Nights of Lights community tree lighting, food, and music at Halagueno Arts Park and the Electric Light Parade. This year’s theme, “Downtown Christmas with Silver,” honors the 25th anniversary of Christmas on the Pecos. In addition to the Trinity Hotel, which offers luxurious rooms outfitted with four-poster beds and rainfall-style showers, consider the upscale Fiddler’s Inn, a century-old four-guest-room retreat at the north end of downtown with smartly furnished rooms and rates that include breakfast two doors down at the cheerful Blue House Bakery & Cafe.